Sean Hillen has garnered a wealth of experience in print and broadcast media over more than 30 years in several different countries including Ireland, the UK, Romania and the US, including working at the United Nations Media Center in New York and being foreign correspondent for both The Times and The Telegraph, London. Sean has also directed training programs for international development organizations such as UNICEF, the United Nations Development Program, the United States Agency for International Development, the German Marshall Fund, the European Union and the British Know-How Fund. International media training in Europe and the US was a natural extension of Sean Hillen’s journalism experience and has ranged from teaching university-level communications courses to establishing the first network of journalism schools in post-Communist Romania. His work with organizations mentioned above has range from the production of health education materials and community newspapers to hosting conferences, seminars and training programs in specific sectors. He has also assisted companies to strengthen their PR, media relations and CSR strategies. In Ireland, Sean established his own training group, FIOS, meaning ‘knowledge’ in Gaeilge, which provides courses for community organizations, companies, banks and trade and professional associations. The courses, which take place at client offices or at designated locations, range from media and public relations skills to broadcasting, brand development and marketing, time management, presentation and innovation strategies. 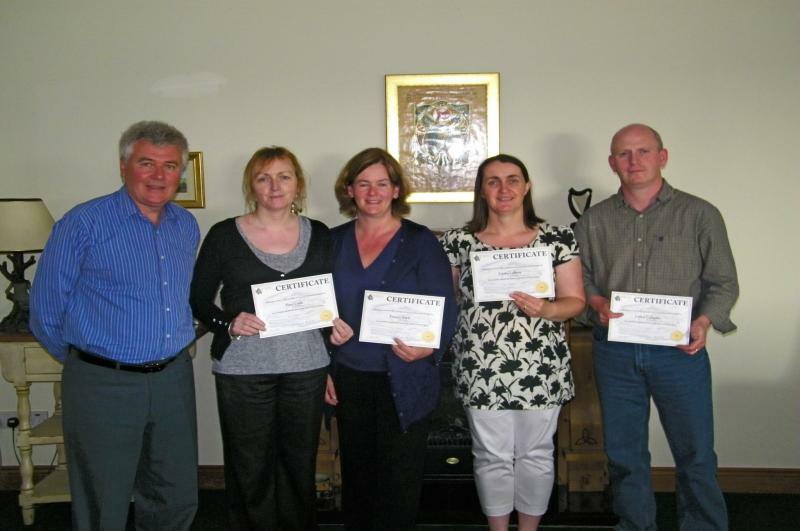 Community leaders in Ireland proudly display their certificates upon finishing the ‘Mesmerizing Media’ coaching course. Contact us if you’re interested in training tailored to your needs.